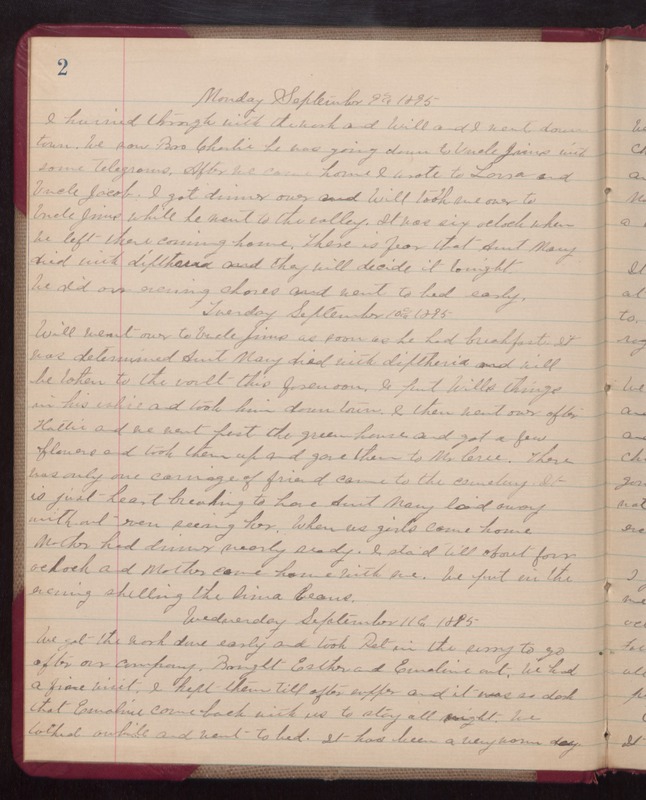 Monday September 9th 1895 I hurried through with the wash and Will and I went down town. We saw Bro Charlie he was going down to Uncle Jims with some telegrams. After we came home I wrote to Laura and Uncle Jacob. I got dinner over and Will took me over to Uncle Jims while he went to the valley. It was six o'clock when he left there coming home. There is fear that Aunt Mary died with diptherea and they will decide it tonight. We did our evening chores and went to bed early. Tuesday September 10th 1895 Will went over to Uncle Jims as soon as he had breakfast. It was determined Aunt Mary died with diptheria and will be taken to the vault this forenoon. I put Wills things in his valise and took him down town. I then went over after Hattie and we went past the green house and got a few flowers and took them up and gave them to Mr. Cree. There was only one carriage of friend came to the cemetery. It is just heart breaking to have Aunt Mary laid away without even seeing her. When us girls came home Mother had dinner nearly ready. I staid till about four o'clock and Mother came home with me. We put in the evening shelling the lima beans. Wednesday September 11th 1895 We got the work done early and took "Pet" in the surry to go after our company. Brought Esther and Emaline out. We had a fine visit. I kept them till after supper and it was so dark that Emaline came back with us to stay all night. We talked awhile and went to bed. It has been a very warm day.